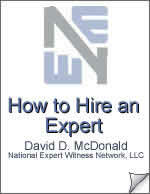 How to hire an expert witness - National Expert Witness Network, Inc.
Back to About Us The Guidebook on How to Hire an Expert Witness was taken from the audio narrative for the course by the same name, written by David McDonald, President & CEO of NEWN. This 22-page Guidebook is intended to help any attorney unfamiliar with the process of finding, vetting and engaging a high-technology Expert Witness. "I was impressed with your expertise, professionalism, and meticulous attention to detail."